Eyenuk’s EyeScreen™ Human+AI Diagnostic Service for diabetic retinopathy (DR) combines independent human specialist grading and artificial intelligence assessment to optimize detection of diabetic retinopathy. EyeScreen's combination of highly accurate artificial intelligence disease detection with the accepted practice of human grading allows users to benefit from the best of both worlds, offering the opportunity to improve patient compliance and HEDIS measures / CMS Five-Star quality ratings while allowing reimbursement through existing CPT codes. Easy to use. Detailed screening report. The EyeScreen Human+AI Diagnostic Service provides an actionable, easy to read, ICD 10 compliant report, allowing seamless documentation of the patient visit. With EyeScreen you can offer DR screening in your clinic to improve patient outcomes and reduce incidence of DR releated vision loss. EyeScreen Service can be seamlessly integrated with your clinical workflow to enable DR screening. EyeScreen Service uses both a validated AI system and specialist human graders to assess retinal images. After these images are independently assessed by both the AI disease detection software and human graders separately, an ICD10 compliant report is sent to the physician. In the event that the AI and human graders disagree, the images are adjudicated by a highly experienced human expert. Human specialist graders also report other incidental findings from retinal images, including signs of other vision threatening diseases such as macular degeneration and glaucoma. 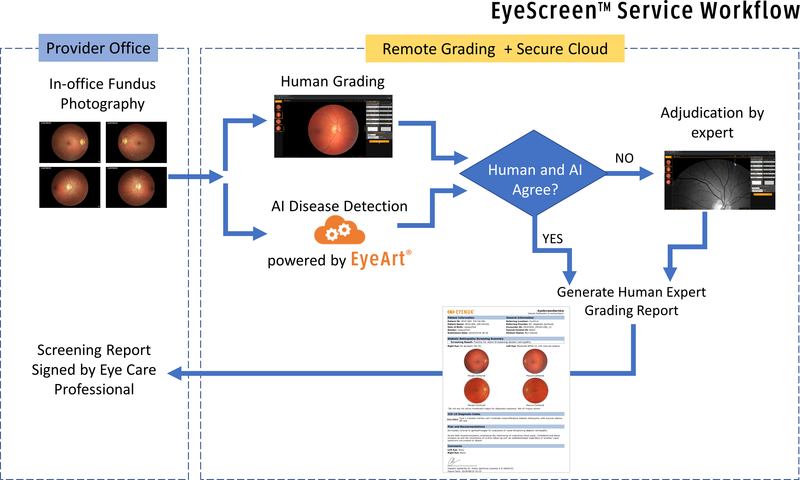 Combining the high accuracy of AI disease detection with the accepted practice of human grading, EyeScreen is designed to improve the overall safety of the system in contrast to other teleretinal screening services that only use human grading. Can help ensure patients with silently progressing DR are identified in time for referral to an eyecare specialist while reducing unnecessary referrals. Can help focus on those patients with greatest need for care. EyeScreen is powered by EyeArt, which has demonstrated high sensitivity and specificity in the real world. Read EyeArt study on 100K patients here. Solanki et.al, “Validation of EyeArt Automated Diabetic Retinopathy Screening System on Large Cohort of Mydriatic and Non Mydriatic Telescreening Data from EyePACS.” Investigative Ophthalmology & Visual Science 58, no. 8 (June 23, 2017): 3775–3775. the patient visit. The report provides eye level and patient level diabetic retinopathy outputs and also indicate severity of DR and presence or absence of macular edema. 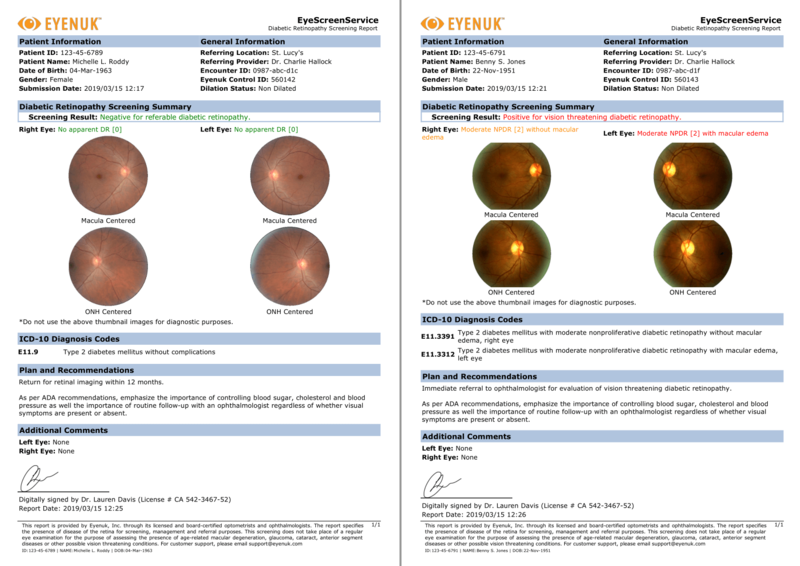 Click on the image to view sample EyeScreen reports. EyeArt system is the most extensively validated AI technology for autonomous detection of diabetic retinopathy. EyeScreen service's HIPAA compliant encrypted data storage and communication ensures that your data remains secure and private, always. If you are interested in knowing more about EyeScreen Service or trying EyeScreen for yourself, click on the button below to fill a short form and someone from our team will get back to you promptly.